The brand Edifier is less known in the United States than it is globally. However, they have a history that reaches back to the mid 90’s. Although the company is relatively small, they produce about eight million various electronic units a year that are distributed to over 70 countries globally. The S2000 Pro is a demonstration of Edifier’s commitment to creating superior electronics. The S2000 is constructed thoughtfully. Its thick, natural birch side panels and high-quality finishes are just the surfaces of the speaker's offerings. The units have four On-Board EQ settings meant to allow the listener a professional sound experience unaffected by either balanced or unbalanced connections. There is a lot of excitement and hype surrounding these studio monitors, and they can be hard to find, and they sell out quickly. In this review, we will see if the S2000 Pro stands up to the hype. We will be looking at the speaker's specs, appearance, sound quality and other relevant features. We also will compare them to three other monitors, rating them all based on price, ease of use, assembly time, design quality, and their warranties. The S2000 Pro uses a newer electro-acoustic technology mingled with a low-distortion flat diaphragm tweeter. The units aluminum cone woofer is able to fully exploit the speaker ’s miniDSP function, making the base weighty and loud. The right speaker is the only unit with controls and connections, while the left unit is bare, save one port to connect it to the other speaker. It is worth noting, the 5-pin connector used to link the two speakers is proprietary. The claim is it is specially designed to reduce interference and separate treble and bass. About the only thing lacking is an HDMI port for easier TV connection. That said, the units are more geared toward professional studio use, so we forgive the exclusion…sort of, since there is a high definition connection option that we will discuss later. Also, since they are Bluetooth speakers, they can still be paired with your device and link it to some more advanced TV systems. Speaking of Bluetooth, the CSR8645 chipset with aptX decoder is used for Bluetooth 4.0 connection. As far as bass, there are only two base ports on the back. At low frequencies, the sound is pretty full. It is realistic to do a sufficient playback without a subwoofer. The Edifier S2000 Pro is 8" in x 13.5" in x 10.5" in (WxHxD) and has two genuine birch sideboards per speaker. The outside is deceiving because they look inconspicuous. You would never guess they are stuffed with a surprisingly large amount of cutting-edge technologies. Yet, they are. The speakers use a low-distortion flat diaphragm similar to a planar tweeter. The woofer is only 5.5" and made of a black anodized aluminum cone. A KLIPPEL precise analysis system allows the cone woofer to take advantage of the DSP digital electronic crossover. The cone is sturdy on all points, and its suspension is stiff and sufficiently damped. The tweeter is unique in its design, and no corners were cut. Rather than a neodymium, as is typically found in less expensive units, it has a ferrite motor structure. The engineering on the driver is well thought out. Its ribbon uses a waveguide to help manage directivity while a phase plug minimizes resonances caused by higher frequencies. The right speaker connection options are well thought out. There are unbalanced RCA and balanced XLR analog inputs. Although the control speaker lacks an HDMI cable, it does have a Toslink digital input, making the speakers ideal for replacing soundbars on HDTV displays. There is also a coax cable input. Other than connections, along the back panel of the master speaker, the bass, treble and volume dials are found. While there is a power switch, it has to remain on at all times in order for the remote to be used for power control. All the functions are digitally controlled and linked to the DSP. The units have a fourth order enclosure a bass reflex design with a flared port two inches in diameter. As mentioned before, the S2000 is outfitted with aptX Bluetooth 4.1, which simply means the Bluetooth connection should be nearly flawless. All that majesty sits atop four brass feet with rubber padding that stabilizes the speakers as well as minimizes resonance transfer. That is only a taste of how well the internal layout of the speakers has been engineered; they only get better the more you pick them apart. In fact, there are only a couple of flaws we could find with the design. Frist, the connection cable is a bit excessive in length. Second, the remote seems as if it does not belong with the set. It is much large than even remotely required, no pun intended. You would think there were a host of functions on such a large apparatus, but no, it only controls the EQ selection, power, volume and playback controls. What is surprising is that it is so large Edifier could have easily included a way to control the bass and treble, but didn't. Actually, there is one more flaw we could find. The users manual is minimalistic to a fault. The fact the 4 EQ positions impact everything, but the balance was completely left out of the manual. It would have been nice to have that information up front. However having picked apart those issues, we must admit it was hard to find flaws with these monitors. They sound as good as they look. 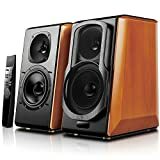 The Edifier S2000 Pro speakers are hard to find. The fact they sell out almost as quickly as they get stocked speaks to their quality. If you can find them, you will pay between $400.00-550.00. Where you can buy them is a little more tricky. Amazon does sell them, but you may have to go to Amazon UK to find them in stock. That said, shipping could get dicey. Other than Amazon, you could try to find them at major electronic stores. Newegg may, and we stress may have them on a good day. If you find them, buy them, because they won’t sit on the shelf while you make a choice. We picked three similar speakers available on the market to see how they compare to the Edifier S2000. As mentioned before, we will be rating the speakers on a set of criteria including their price, ease of use, assembly time, and design quality. We will give brief specs for our comparison models as well as pros and cons of the systems. This group of comparison speakers has some surprising results, including one speaker that may prove specs only go as far as design quality, and one can negate the other. Also, some of our comparison models are sold individually, but we have reviewed them all in pairs to keep things consistent, all pricing reflects the purchase of two speakers. BLUETOOTH WIRELESS - BT v4.0 with aptX decoder makes playing high fidelity audio from your mobile devices at ease. Room-Friendly: This means you don't have to be right in front of the speakers to make accurate adjustments to your mix. These JBL speakers have the same Image Control Waveguide from the company’s flagship M2 Master Reference Monitor. They come in three sizes, we are discussing the 8 inch, and feature a Class D amp that puts out 56watts for the tweeter, and 56 watts for the woofer. The soundstage is pretty solid, although a soft hiss can be heard if you are too near the speaker. For producers, coloring issues mean your mixes may not translate to other sources the way you hear them on the monitors. The materials used range from sturdy to rather cheap, and there does not seem to be cohesion to design choices. The also units have an unnecessarily large footprint, 16.5 in x 10 in x 12.1 in. Pricing is all over the place, so choose the vendor you purchase from carefully. The Yamaha HS8 has an odd position where they are not quite suited for the average listener, but they are also still slightly colored enough only to be useful for the mixing and mastering of certain genres. They provide a relatively flat response. They are visually neutral and understated, but still attractive. The materials and overall construction of the speakers are very good. Features such as the MDF having a damped acoustic response and three-way mitered-joints that help eliminate random resonance are examples of the attention to details that have made them a studio staple. The HS8 can go sub-woofer free, a bonus if you’re trying to save cash. A downside is they have very obvious bass build up and distortion if they are in a smaller room where enough space cannot be placed between them and the walls. The Rokit 6 has a 47.5Hz to 34.5kHz working frequency range (–3dB) and is bi-amped using a Class–AB 75 Watt, almost, amplifier. The woofer and tweeter are supported by a 48W and 25W power stage, respectively. The tweeter is driven by way of a 2.3kHz. Active crossover. The speakers can handle SPLs up to 107dB, and a waveguide matches tweeter and woofer dispersion at crossover. The effects of close wall mounts are reduced by way of a frontal base point. We could go on, but you can probably tell this speaker should be pretty solid for the price, it even comes with three-year parts and labor warranty. Unfortunately, these units are known to fail… often. Also, some argue, for the price, the sound quality could be better. With the S2000 Pro, Edifier has managed to produce speakers that almost justify purchasing studio monitors in this price range. They are inarguably attractive, the build quality is excellent, and their sound is true. Some aspects we like are the clean receiver-less setup, Bluetooth support, and their sonic performance. They are a prime choice if you want a detailed, pure sound. All that said, there are a few things we like less. The remote is nice to have, but it is larger than necessary and very pointed. It also does not have the ability to address functions such as bass and treble, which means you have to go to the master unit every time they need adjustment. For casual use, more standard TV soundbars would be better for anyone who does not have state-of-the-art TV components as HDMI is not a hookup option. There is also no output for a subwoofer. Overall we give the S2000 Pro a 4.5 rating since we had to nitpick just to find those few flaws. Edifier S2000 Pro Speaker offers clear and detailed sound which is excellent for entertainment. It also has great aesthetics and can seamlessly blend to theme of the room. However, it has no subwoofer output.